My twenty-one year old son Ben is taking me, his mother, to see ‘Phantom of the Opera’ on Broadway. Smile. I received an e-mail from his teacher asking if this is possible. It was easy to make the call to connect with dear friends outside of the city, determine the best date to attend a Saturday matinée show, and e-mail back to Ben’s teacher with enthusiasm. I shared that there is a wide range in seat prices for Ben to consider. I received a response within an hour from his teacher saying that Ben had already bought the tickets, and when presented with the options for seating, he chose the very best seats available for that show, again without hesitation. I am so excited! Really. I feel like a little kid getting ready to explore new territory with a trusted beloved presence in my life. I have never seen ‘Phantom’ live on stage either. After all the years of living in NYC (where Ben was born) and all the shows we’ve seen, somehow we have missed seeing this longest running show in the history of shows. Phantom of the Opera opened in London on September 27, 1986 and opened in NYC at the Majestic Theatre two years later. I think back to when Ben’s obsession with the story and the music began. I can’t pinpoint it exactly, but I know somehow my father was involved. The image is of Ben and Dad driving in the car together, Ben wanting to listen to his Barney (yes, the purple dinosaur) music, and my father countering with his Phantom of the Opera CD. I’m pretty sure this is close to the truth. 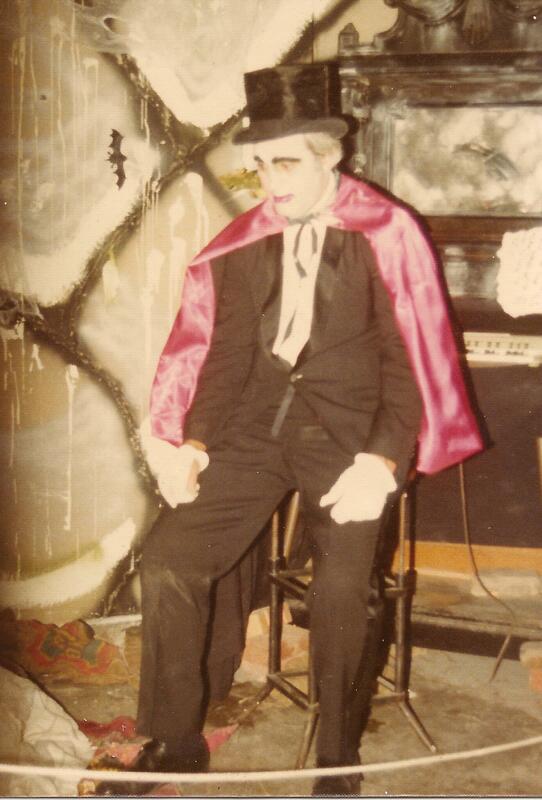 I remember having a random thought of ‘hmmmm, Dad listens to Phantom of the Opera?’, and then a clear memory appearing of when he actually dressed up as and played at being ‘The Phantom’ in a haunted house production when I was in high school. In 1974, there was no romanticized stage show and movie of this story. It was just the legacy of black & white film star Lon Chaney as a scary monster version of The Phantom to draw inspiration from, and Dad did a good job at being scary! I am generationally sandwiched between two men I adore. Which brings me to the heart of this sweet endeavor I am soon to embark on with my son. It feels like a rite of passage. I can feel the man in him reaching beyond his mother toward the man his grandfather is, honoring and cherishing where he feels love and support in his life while beginning the process of giving back at the same time. I can feel the threads of his charm and independence and integrity beginning to weave a clear path for his desire to follow…. I have had moments of worrying that Ben might identify too specifically with the sorrow that the Phantom carries. But in the end I’m convinced he identifies mostly with all the levels of yearning for love in a way that allows him to reach out and connect. Since he has been at school at Berkshire Hills Music Academy, he has found an authentic context for safely exploring where this yearning leads. His lessons in voice and dance have given him opportunities to experience what is feels like to truly embody the passion that lives in him as he performs for his community when on stage and in his life each day in his work. 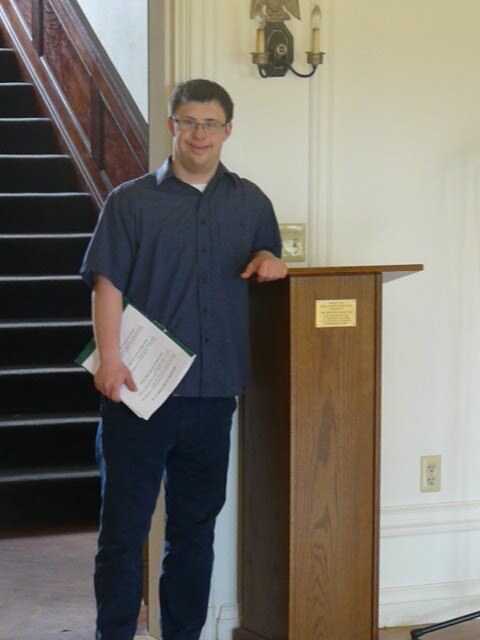 Here his is, poised to deliver his second year recital. With confidence and calm, he introduced and delivered a performance of a program that literally knocked my socks off. Of course there was a piece from Phantom of the Opera. I’ve wondered about his choice to sing “Think of Me”**, the song that the star Christine sings for her stage debut and capturing the interest of her childhood friend Raoul. It is a sweet song, full of desire for being seen in the wake of something remembered. He didn’t sing it with melancholy however, he sang it with his hand on his heart and a smile on his face. That’s Ben. Reminding us…. Oh, Kathy, this made me cry.Yes…what a gift !! What a beautiful image of Ben — weaving his charm,independence and integrity into a path that includes treating you to what promises to be a wonderful experience. I’m thinking he got his spontaneous generosity from somewhere!